There are many different types of argument for libertarianism. Eduqas focuses specifically on three. Sartre was an existentialist philosopher. He famously said "Existence precedes essence". Sartre was an atheist, and he didn't believe we were "made in God's image" and given a specific purpose. When you make something, you know what it's for. If I made a pencil, the pencil would be for writing. Humans are different for two reasons. Firstly, we weren't made for something. Secondly, we are self-conscious, so we can choose our essence. Sartre believed there was only one thing we couldn't choose. We are condemned to be free, and cannot choose not to be free. You might presume Libertarianism would be liberating! Sartre found it nauseating. It's a horrible responsibility, and as a result, some people try to escape it. There are lots of examples. Many Nazis claimed that they were 'only following orders' when they played their part in exterminating 6 million Jews. However, Sartre thought that they were acting in 'bad faith'. Eduqas expects you to know the example of a waiter who 'acts like a waiter' using exaggerated gestures. He is making himself into an object, and denying his own freedom. Sartre is saying that when we do this, we are actually acting freely, but in bad faith. We are choosing to behave as though we are a thing, with no freedom, but in doing so, we are freely choosing this. That's why it's bad faith. Sartre is making a general point here about any line of work, and is criticising our own behaviour as well as the way others treat us. When we behave like a thing, or we objectify other people, that's bad faith. Sartre is saying that we are always being ourselves, so Dave the waiter can't stop being Dave by trying to act the part of a waiter. Dave needs to be authentic, rather than trying to be 'The Waiter' by acting in the way a waiter acts. Sartre is also criticising those restaurants that expect the waiter to be invisible and inhuman. Sartre sees two levels of bad faith. Firstly, we are a 'being-for-itself', but we can reduce ourselves to just a 'being-in-itself'. For example, someone who behaves like an animal, giving in to desires by over-indulging, may claim that they 'had no choice'. However, they are in bad faith, as they were choosing to give up their freedom. The alcoholic stops acting for himself, and just as a being in itself, claiming that he had no freedom to resist a drink. Secondly, we can allow others to use us. A waiter falls in this second category, by deciding to behave as society expects a waiter to behave. He is still a transcendent being-for-itself, but acts as if he is not, and as such is in bad faith. The answer is clear - Sartre believes we should recognise our freedom in every situation, and not pretend that we have no choice. There is not much to say here, so I doubt Eduqas would ask a question exclusively about the science behind Libertarianism. As part of a question on why people hold Libtertarian views, or a (b) question evaluating whether people are right to hold such views, you could refer to the work of Angela Sirigu. Sirigu claimed to have identified the part of the brain that makes choices. Recently, Sirigu has made headlines waking a patient who'd spent 15 years in a vegetative state, and in 2016 she wrote an article called 'Reward and decision processes in the brains of humans and nonhuman primates'. It is more likely that Eduqas is refering to her earlier work, explained in a New Scientist article from 2009. Below is a quote from Sirigu in that article. New Scientist describes how poking the brain in the parietal cortex causes the desire to wiggle your finger or move a limb. "Conscious intention and motor awareness thus arise from increased parietal activity before movement execution." "(i) Stimulation of the posterior parietal cortex caused human participants to intend to move and to report having moved, even in the absence of actual motor responses. (ii) Stimulation of the premotor cortex triggered limb and mouth movements that were not consciously detected by the patients." Sirigu's research hardly proves we are free. Others have argued against free will, as they had measured brain activity occuring before someone has the conscious intent to do something. It looked like our unconscious brain had caused our behaviour, we had then become aware of this and mistakenly believed we had free chosen the action. One example of this is from Patrick Haggard. "It has been reported that stimulation of the SMA triggers an urge to move that resembles an irrepressible desire to move going beyond patients’ will. This suggests a potential role of SMA in generating motor intentions. However, intentions evoked by stimulation of SMA stand in contrast with what was described by our patients, who reported experiencing an endogenously generated wish to move." Sirigu may have identified part of the brain that is involved in decision making, but she has hardly proved that our choices are undetermined simply because we are aware of our choices. This is because the awareness of our choices might come after our decision has been made, not before. For Libertarianism - Sirigu has offered the first significant piece of scientific evidence to support free will. Until now all the evidence had been on the side of determinism. Her evidence is consistent with our human experience and so is compelling. Against Libertarianism - Sirigu’s research only tells us where the event of choice takes place, it does not tell us that the choice we make is free. Just because she has not yet found a cause for why people choose A over B, does not mean there is no cause. The urge to act was still caused in Sirigu’s experiments and so we may still be determined. Please note, Carl Rogers' approach is humanistic, not humanist as suggested by the syllabus. This is a psychological approach that emphasises the drive in humans towards self-actualisation. Whilst optimistic, Rogers is not saying that we are all free, but that we have the potential to be free. "This process of the good life is not, I am convinced, a life for the faint-hearted. It involves the stretching and growing of becoming more and more of one's potentialities. It involves the courage to be. It means launching oneself fully into the stream of life." On becoming a person: A therapist's view of psychotherapy. “The curious paradox is that when I accept myself just as I am, then I can change.” ibid. You will be asked two kinds of questions: AO1 and AO2 - (a) and (b) questions respectively. Make sure you are ready for both types of question - se below. 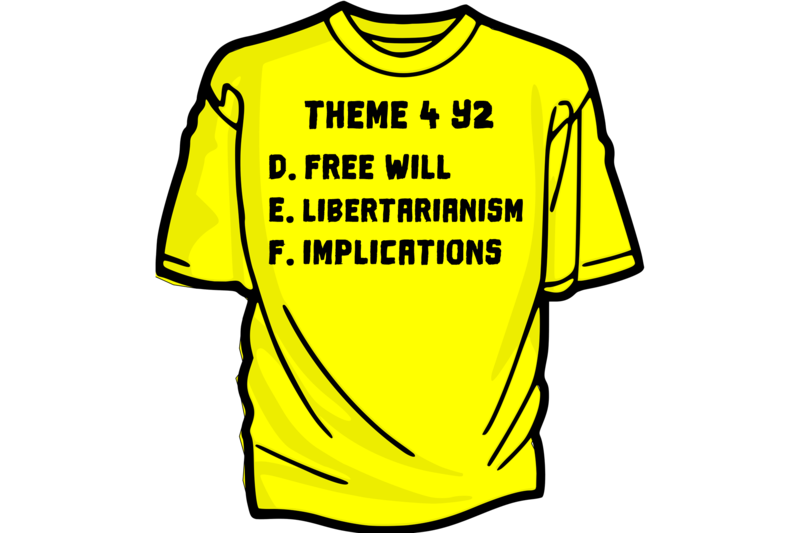 (b) To what extent do philosophical, scientific and/or psychological views on libertarianism inevitably lead people to accept libertarianism? (b) To what extent shoul free moral agents follow a normative ethic? Explain Sartre's existentialism, refering to the waiter example and the concept of 'bad faith'. Describe Sirigu's experiment with the parietal cortex, and say what it might mean for free will. Explain Rogers' idea of self-actualisation, and how it is a rebuttal to determinism. Does Sirigu or Roger’s work conclusively prove that we are free? What strengths or weaknesses are apparent in the idea that we are born a ‘blank slate’ and ‘make ourselves’? Does it take ‘faith’ to believe in Sartre’s position? What assumptions are made by libertarians?